Why Aren’t There More Indian Tourists at Angkor Watt? Last week as I wandered the grounds of the largest religious complex in the world, Angkor Watt, there was a question in my mind. Why aren’t there more Indian tourists around? I saw many Japanese, Koreans, Chinese, Europeans, but where were the Indians? After all, Indian tourists are all over next door Thailand, just a few hours away by road and even shorter by flight from the nearby city of Siam Reap, Cambodia. Why is this even important? Angkor Watt, meaning “Temple City” in the Khmer language, was built in the early 12th century during the reign of King Suryavarman II (1113-1150). He ruled over a Hindu empire and Angkor Watt was the jewel in his crown, an amazing structure built on land in the middle of a man-made lake. In a process not clearly documented, the temple by the end of the same century had become a Buddhist place of worship. As I walked through the halls there would be here and there a Buddha stature, obviously dating in some cases to a much later period. 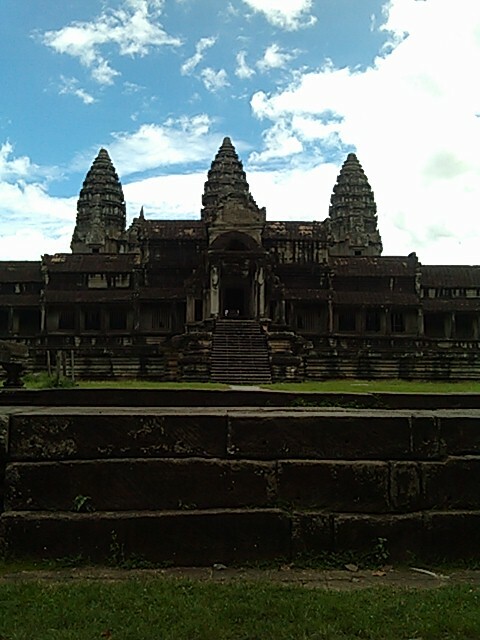 In 2013 there were 2 million tourists to Angkor Watt, and the numbers continue to increase. But why not from India? After all, this is one of the most impressive Hindu architectural marvels of the world, and one of the oldest and best preserved. 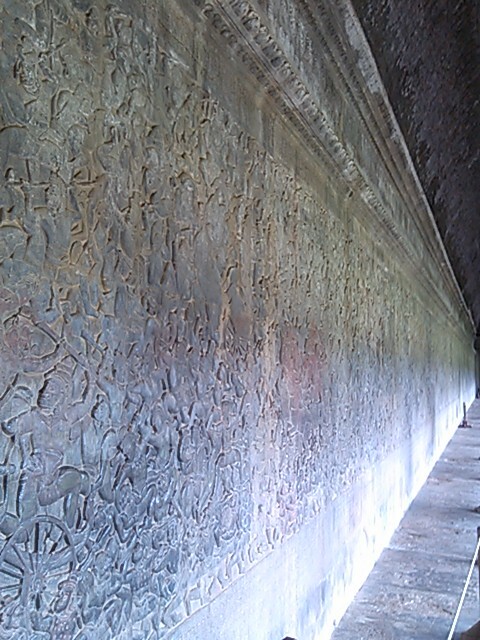 It has some of the most intricate wall friezes from the Mahabharata (Great Story), one of the two most important (and treasured to Hindus) Sanskrit epics along with the Ramayana. The origins of the Mahabharata go back to the 8th-9th century B.C. and it is the longest epic poem known to man. It also has 1.8 million words, and is ten times longer than the Greek epics Iliad and Odyssey combined. Scenes of this epic poem stretch along the inner walls of the complex and are breath-taking in their detail. They are also some of the most well-preserved parts of the temple. As I walked these halls, I expected to see groups of Indian tourists observing these wonders, yet only saw less than ten the hours I was there. Perhaps it was an off day or perhaps there are other reasons. Some of those reading this post may have answers to this question, and I would love to hear those. Let me advance a couple of possible answers that have potentially larger implications. First, a simple answer may be that I just didn’t have enough days to make an educated observation. Maybe there are Indian tourists coming and it was an off-day. But as I asked local restaurant people in nearby Siam Reap, the overall impression was that they don’t see that many. There are a couple of Indian restaurants in Siam Reap which is always a good sign! Another reason is that perhaps a tour to Angkor Watt has not hit the tourist communication sites in India and the worldwide Indian diaspora. This seems strange due to the way Indian tourism has skyrocketed in recent years, including within Asia. Could it be that Cambodia is perceived in India to be part of the China “sphere of influence” and therefore not as much marketed there? China indeed does have lots of economic and cultural influence in the country as of course does Vietnam as well. I also wonder if the reason could be part of a larger lack of perspective of the important historic role India had beyond its borders in earlier centuries. Up to the 15th century the Indian Ocean was arguably the most important trading zone in the world. India’s empires had spread into SE Asia and Indochina, as evidenced by the Hindu kingdom in the 12th century in what is now Cambodia. India has always been more a civilisation than a nation. 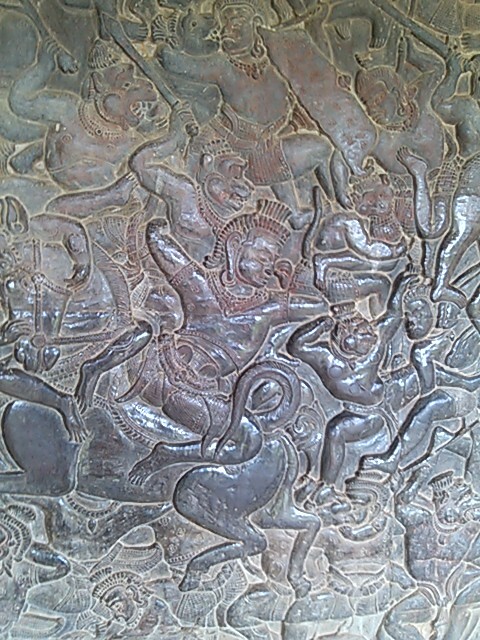 Angkor Watt is a living symbol of this important historic role and demands interest, whether one is a Hindu or not. One friend I talked to with long years of experience in the country said that perhaps the Khmer Rouge saw it also as a Khmer cultural symbol, too important to destroy. Or even that they may have been afraid of its spiritual power. It is hard to say of course, but we can be grateful that they were not in power longer in any event. So back to the original question, why aren’t there more Indian tourists at Angkor Watt? And along with that, why in so many Indian and Asian educational institutions are the histories of Western colonialism taught sometimes more than the place of Asia and India in world history up to the dawn of the colonial empire age in 1500? (This also can be true of Western universities as well). Why is there not more taught on the spread of the Christian church in Asia before 1500? For those of you reading this from India, learn more of your amazing history in the nations. For those of you reading this who are Christians (or interested in a balanced view of religious history) from any part of the world, learn more of the history of the Church in Asia the first 1500 years. You will be surprised by what you find out!! Previous Post ARE YOU NERVOUS?